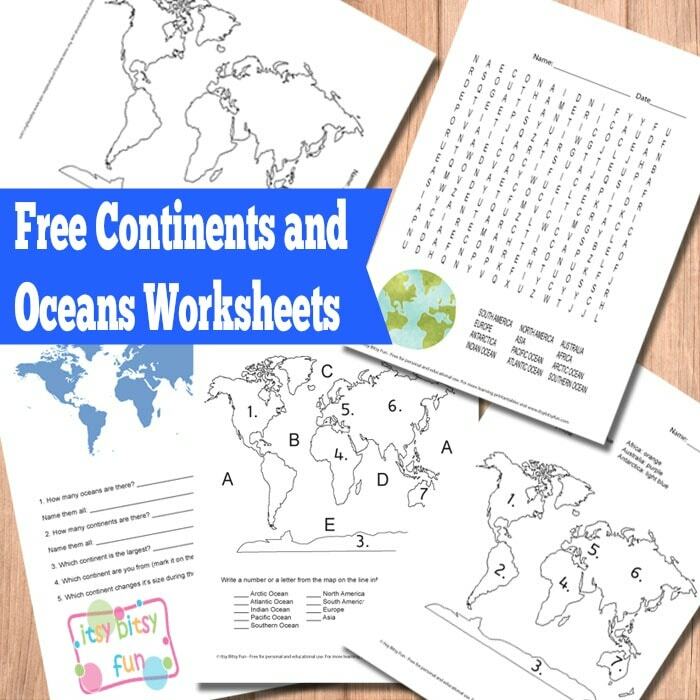 Learn all the continents and oceans with this printable set of free continents and oceans worksheets for kids! There is a selection of worksheets in this pack, with various approaches to learning the continents and oceans to offer maximum diversity for engaging learning experience. Many kids struggle with geography, and learning the continents and oceans can be a tough challenge. Many times there are issues with learning and recognising (on map) Africa and South America as they can look alike and misplacing the oceans is a common issue too. Most kids manage to master it eventually, practice certainly makes a difference and this is where this set of engaging worksheets comes in. How many Continents? How many oceans? 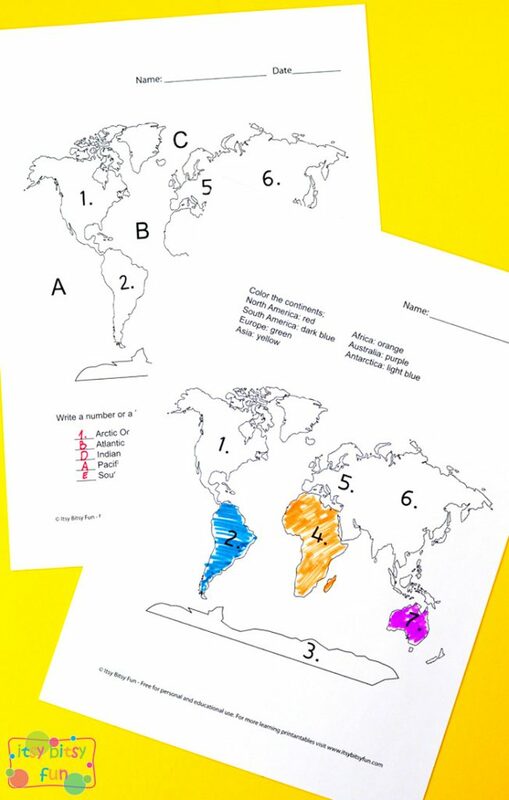 There are 7 continents on all of these printables although we know some places teach different numbers (from 4 to 7). How many should you teach to your kids and students? The number depends on your school system, so we advise you stick with the official version for your region. We also advise that you teach your kids that different countries can teach differently. It’s always a fun fact for kids to hear! What is the best way to teach continents and oceans to kids? If kids aren’t yet familiar with the names we suggest starting with word search puzzles. Supply your kids with a map or an atlas along with the word search puzzles and have the kids also find the continents and oceans as they solve the puzzles. It’s stress free and fun. Depending on age and knowledge your kids or students have, then continue with the use of other worksheets that focus more on identifying the continents and oceans on world maps. Blank map makes a perfect worksheet! We also prepared a blank map, that will help your kids practice the knowledge gained even more. We prepared two versions, one with 5 oceans and one with 4 oceans so grab the set that is in line with your schools curriculum. If you would like to include the newest ocean – the Southern Ocean these set of worksheets are for you. 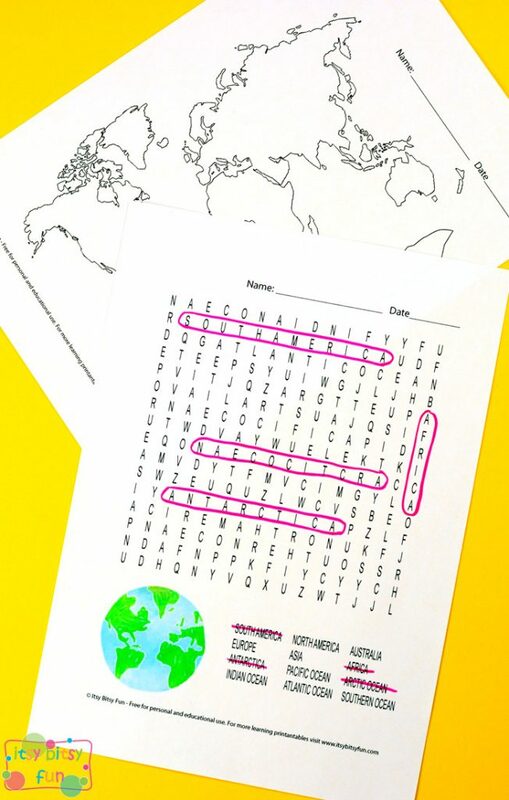 There are 5 different word search puzzles, label the continents and oceans. If your kids learn about 4 oceans this pack is perfect. You can also combine this pack with the 5 ocean one to explain about the change.